Daniel Reznick decided to follow in his fathers footsteps and graduated from the Scholl college of Podiatric medicine in 1996. He did his residency at the Boston VA medical center before joining the practice in 1998. Dr Dan is board certified foot surgeon and fellow of the American college of foot and ankle surgeons. 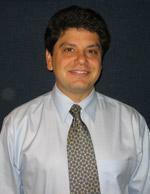 He is a member of the Podiatric Mentors network and specializes in diabetic foot care. Dan and his wife Amanda have two daughters; Sophie and Chloe. A chocolate lab named Dora. They love to spend the weekends camping, hiking, and boating.